The time has come that having an impact gun around the place would come in handy and make jobs easier. Now I've got a small compressor, but just how much air do these tools use? What are your experiences? All I would say is get much bigger than you need. The CFM needs to be calculated with a loss of one 1/3 to know the Free Air delivery. You have 3 phase to the house don't you - aim big - 14CFM will cut it for airtools but by the time you want to do the odd bit of sand blasting at home and then spraying your car and using an airfed mask you will want an 18CFM. I've got a large compressor which won't run impact guns and struggles with a cut off grinder...but we're limited on the power by 240 electrics. I'll post the specs in a few days. Good point. Our 14CFM runs out of puff with the air grinder quite quickly. An 18cfm compressor looks like its going to be pretty expensive! So looking at the problem in a different way, what are electric impact wrenches like? I've got a cheapy cordless impact driver which has saved me on a couple of occassions with hub nuts, but they're too unwieldy imho for general use. I think I'll go down this route for the moment, its hub nuts and the like that are causing me problems. Buy the most powerful one you can afford, Mine was a gift so not sure on the exact price but it would have been less the a hundred pounds...it's probably mid range on power but has used both batteries to shift some obstinate nuts. Buy one with two batteries or a quick charger. Edit: Mine is the 150L version, not 200L, but the other specs are similar at 14cfm and 8.6cfm of free air. Last edited by wrinx; 01-09-12 at 17:08. Having had a few compressors over the years and had to listen to them all and cuss them when they run out of puff the next one I get will be something along these lines albeit a bit more keenly priced, they come up on ebay all the time for decent money. Don't think I'd ever max that kind of output and quiet too. Thats quite a lot of puff. Mind you I'd need to built a small shed for it to live in. My compressor died for the third time in two years so have decided on a whim to get a new one. But having read through this I'm not so sure if it'll be powerful enough. 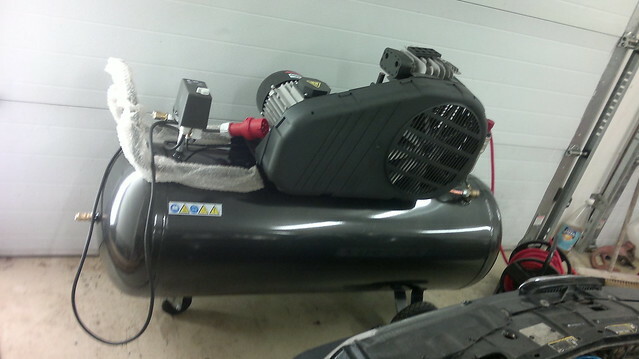 It's a 3 phase, 4hp motor with 200l tank and 16,9 cfm. The next in the model range was a lot more expensive (about €500 more), but now I'm thinking I maybe should've gone for that one. I think you'll be fine with that one Finn. As soon as you buy one there is always going to be what you think is a better one come along. You could go on for ever until you end up with one that is far too powerful for your day to day needs. I think its time to turn this into a 'show us your compressor' thread. We went to get it last friday. It's a huge improvement over the last one, even though this one also runs out of puff quite fast and it is quite loud. By Evodelta in forum Alfa Romeo Q4 Tech. By alfista_AR in forum Alfa Romeo Q4 Tech. Difference between and re-circ dump valve and a free to air?